A portable warmer developed by two Indian students and their classmates at Stanford University is helping premature babies survive. It's just another morning at the government-run Vanivilas Hospital in Bangalore. Outside the neonatal intensive care unit, where premature babies are kept in incubators, mothers await their turn to breast-feed their infants. Some 40 to 60 babies are born daily in this 536-bed hospital, which tends to many poor patients. The incubators are full, and a few preemies are swaddled in what look like tiny sleeping bags. These are baby warmers, and have their origins in a classroom at Stanford University, California. With the help of venture capitalists , four alumni - Jane Chen, Rahul Panicker, Naganand Murty and Linus Liang - have turned their classroom concept into a commercial product, sold under the brand name Embrace Nest. The Economist has named the four colleagues winners of its award for social and economic innovation. Previous winners include Sam Pitroda and N.R. Narayana Murthy. The Stanford graduates built the prototype five years ago through their non-profit entity, Embrace, founded to save premature and low-birth-weight babies, who often die for want of body heat in their first few days, especially in poor countries. The non-profit has licensed the product to Embrace Innovations, a for-profit company that operates in India through its Bangalore-based subsidiary Cambree Life Improvement Technologies Pvt Ltd.
Panicker and Chen lead Embrace Innovations, while their other two colleagues have moved on. "The infant warmer went through almost 60 iterations as we learnt from the field and scaled manufacturing," says Panicker, who is President of Products at the company. He adds that all manufacturing is done in Bangalore. Some components are outsourced, but the final assembly and quality testing are done in-house, he says. The product was launched in April 2011 in a few places in Karnataka. When heated for around 30 minutes, it keeps the infant at a clinically optimal temperature for up to six hours. It does not need a constant supply of electricity, making it ideal for a country where power supply is erratic or absent. 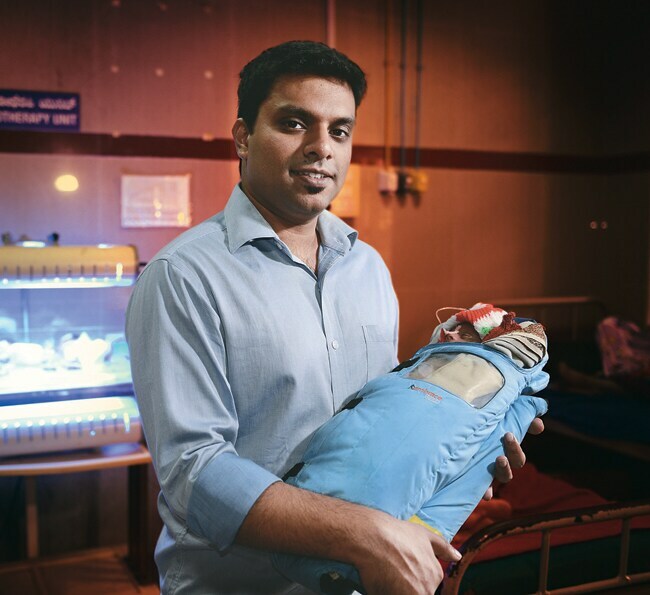 "We use Embrace warmers to move babies within the hospital and between hospitals, without which some are in danger of becoming hypothermic," says Dr Sahana Devadas, neonatologist at Vanivilas. Hypothermia occurs when body temperature drops, a potentially dangerous condition. "Getting customers and the medical community to adopt a new product and concept is challenging in the medical devices industry," says Mark Straub, Director at Khosla Impact Fund, the arm of Silicon Valley entrepreneur Vinod Khosla's venture fund that has invested in Embrace. The other major investor is Capricorn Investment Group, the venture fund of Canadian billionaire Jeff Skoll. Manipal Education and Medical Group CEO Ranjan Pai, Biocon founder Kiran Mazumdar-Shaw and a few angel investors hold small stakes in the company. The non-profit Embrace has a minority stake. "The depth of expertise in the team and the product design are things that we like in Embrace," says Straub. "What we'd like to see them do better is choosing the right partners, and how much time they need to spend on each partner." Hypothermia is a major cause of death in premature and low-birth-weight babies. In India, one in three babies has low birth weight (less than 2.5 kg). Many newborns lack the fat that lets them regulate body heat. In areas where equipment is scarce, the infant warmers can help at-risk newborns survive. "This is an important innovation, because we are nowhere near the global millennium goals in terms of infant and mother health," says Mazumdar-Shaw. Dr Devi Shetty, Chairman of the Narayana Hrudayalaya hospital chain, says he hopes business models will evolve around the product - for instance, rentals to hospitals or parents. "There are cheap incubators, but many are complex and depend on electricity," he says. Panicker adds that while a conventional incubator can cost as much as `10 lakh, the Embrace warmer costs `15,000 on average (the price varies with order size and specific features). In the two years since the launch, the product has been used on about 10,000 babies, says Panicker. He does not disclose financial or sales figures, but says the product is in use in about 1,000 clinics and hospitals in 10 states. "Our margins are enough to enable growth and for the development of future products," he says. "One challenge is that neonatal hypothermia is still not an entirely understood health condition," says Pompa Debroy, Program Director, India, at the non-profit Embrace. The organisation provides free baby warmers in regions where people cannot afford them.